I didn't make toad in a hole, just toasted the bread and put a very sunny-side up egg on top before broiling. Really delicious. Great sauce! This cooking primer covers the classic techniques for preparing the humble egg. From perfectly poached to softly scrambled, each method is clearly conveyed to ensure egg-cellent results. Using her skills as a cooking teacher, Slonecker suggests simple variations such as basting an egg with bacon drippings to add flavor or poaching eggs in wine. After mastering the techniques, the newly skilled can turn to more recipes that feature the egg in wonderful ways. 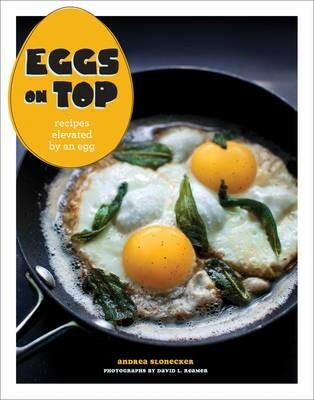 With plenty of extra info on the anatomy of the egg, nutrition, safety issues, grades, and types (duck, quail, goose, and much more), Eggs on Top is the quintessential guide to cooking and enjoying one of the world’s perfect ingredients.